Yesterday, I went to one of the nicest streets in Paris to take a stroll and stop somewhere for a small bite or some drinks. Rue Montorgueil is famous for its nice bars, snacks, fish shops and butchers. During the day it is a very animated street with all shops open and selling fresh products. It is located next to Les Halles, the ancient wholesale market of Paris, and when that worked it was full of restaurants and taverns to feed the people working there. Now it is a Bohemian street boasting plenty of nice places to see. 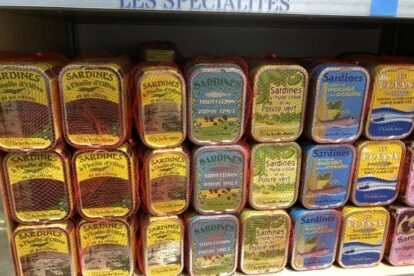 While I was walking there, I found a very particular shop, La Belle Iloise, a shop that only sells canned fish of top quality in different formats. I like very much tuna and sardines in a can. Those healthy and filling things are a regular in my diet, so I decided to come in. To my surprise, the place is bright and airy, and it has plenty of nice things to offer. Now that St. Valentine is approaching, they have created a new recipe they sell in a bag that reads “Ail Love You” which is playing with the sound of the word “garlic” in French. The content is some cans of tuna with a garlic seasoning. Sounds nice, but maybe garlic is not the best choice for an intimate meal?